As my wife and I speak at churches, schools and conferences around the world, we’re often asked questions regarding the subject of hell. Pardon the pun, but it can be a hot topic these days, given that many doubt its literal existence. Although God has given us many answers and instructions clearly in His Word—yes, even about hell—many people fail to read the Bible and thereby remain uninformed. We hope to change that by inspiring people to search God’s Word for themselves. After all, our opinions of what hell is like aren’t important—God’s are! Given that, here are six of the most frequently asked questions on hell, followed by simple and succinct answers that should stir you to dig deeper for what the Bible has to say on the matter. 1. Why did God have to make hell in the first place? Just as prisons have been constructed to protect the innocent from those who break the law, hell has been prepared for the offenders of God’s law. Would you say that our governmental leaders are mean for constructing prisons? No—especially when you realize you don’t have to go there. If you do go, it’s your choice (see Deut. 30:19; Ps. 9:17; 86:5; 2 Pet. 2:9). Besides, hell was not prepared for man but for the devil and his angels (see Matt. 25:41). God never intended for men and women to go there. By contrast, He is preparing a place for us in heaven (see John 14:2). It is only by our stubborn will that we reject the provision He has made for our access into heaven. It is arrogant of us to desire to go to heaven yet demand our own terms of access. If you want to live in God’s house, you come by His way and not your own (see Luke 13:3; Rom. 10:9-10; 1 Tim. 2:4-6). If you want nothing to do with God, then there is a place prepared that has nothing to do with His goodness. Salvation is a free gift, but we must receive it in order to be saved. God loves you and is a good Father. He is trying to keep you out of hell and to divert you from your misguided course. Nevertheless, hell exists—and it will be your own fault if you go there. The simple solution is, don’t break God’s law. Jesus said, “Unless you repent you will all likewise perish” (Luke 13:3; see also John 3:36; Rom. 10:9-10, NKJV). Remember this point: Just as prisons were not the first thing our founders had in mind when they came to this country, so too hell wasn’t God’s first intent when He made humanity. 2. Isn’t God mean and unloving for sending people to hell? God is not sending anyone to hell! He sent His Son to keep us from going to hell (see John 3:16; 6:40; 12:47). All of us are on the road to hell automatically (see Matt. 7:13-14; John 3:17-18) because we all are born in sin and already condemned (see Matt. 18:3; 19:14; Ps. 51:5). If Jesus hadn’t come to die in our place, we all would end up in hell. Because we are sinners, we cannot live in His perfect kingdom as we are. We must be given a new heart and spirit. We become new creatures in Christ (see 2 Cor. 5:17) when we trust in His Son and His shed blood for our sins (see Rom. 5:8; 1 John 1:7). He will not let sinful humanity into heaven, as we would corrupt or defile heaven just as we have the earth (see Rev. 21:27). People think He is mean for allowing so many to suffer in hell, but they don’t realize He is the same God who suffered an excruciating personal death on the cross to keep us out of hell. He loves everyone, even those who deny Him and mock Him (see Ps. 145:9; Rom. 5:8; 1 Cor. 15:3-4; Eph. 2:4-5). If you play a game, you must play by the rules that are established. You don’t apply the rules of another game when you play Monopoly, right? Why do we think God should follow our rules and not we His? He is the designer, not us. God is not mean. He has provided a way for everyone to live with Him in heaven for all eternity. It is we who are mean and unloving for not acknowledging His existence. God’s Word will teach us the truth about heaven if we will only read it. 3. Where was God when the disaster struck? Let’s establish first things first: Disaster usually does not come from God. Evil forces exist on the earth, and we must pray for God to intervene and stop the evil (see John 10:10). God can, of course, send a plague or disaster if He chooses. If He does, then it is usually because rebellion and sin continue after His many warnings have been sent but ignored. Jesus told us to pray that His will be done on the earth as it is in heaven (see Matt. 6:10). Yet, for the most part, men do not pray. So, if we don’t pray, His will is not always done. If we would pray, God could get involved to a greater degree, as prayer gives Him the access to intervene (see 2 Chr. 7:14). We live in a fallen world, and people choose to sin and disobey God every day. There is also a spiritual law of sowing and reaping at work in our world, and destruction is a result of sowing sin (see Prov. 13:21). In addition, God has given humanity dominion in the earth (see Gen. 1:28; Ps. 115:16). He also has given the born-again Christian power over the devil (see Luke 10:19). The mess that the earth is in is not God’s fault but man’s. If God weren’t intervening through our prayers, then we would have destroyed ourselves long ago. There are no disasters in heaven, and this is His will for the earth, too. 4. What about the person in the jungle who has never heard of Jesus? You don’t have to worry about him; the Bible says God is fair and just (see Deut. 32:4; Ps. 96:10,13; Acts 17:31). If that person looks up at the heavens and cries out: “God, I want to know You. Please reveal Yourself to me,” then God will somehow make Himself known to that individual. He even gives people dreams and visions to keep them out of hell: “For God may speak in one way, or in another … in a dream, in a vision of the night … He keeps back his soul from the Pit” (Job 33:14-15,18). God warns us throughout our lives in many ways in order to keep us out of hell. He warns us through His creation (see Rom. 1:20), our conscience (see Rom. 2:15), His Bible (see 2 Tim. 3:16). If the person in the remote jungle doesn’t cry out to God to reveal Himself and doesn’t believe in the Son of God as the only Savior, then he will die in his sins, as the Bible says: “The wicked shall be turned into hell, and all the nations that forget God” (Ps. 9:17). There are signposts of warning all along our road of life. Bible teachers say there is a warning about hell in each of the 260 chapters in the 27 books in the New Testament. If you equated those warnings to actual signs on a highway and equated the 27 books to 27 miles, then there would be a signpost every 540 feet, or about every six seconds when traveling 60 mph. If we ignore all those signs and then drive off a bridge, it is our own fault, not the sign-maker’s. God will find a way to make Himself known to all of the people in our world. The more important question is this: Now that He has made Himself known to you, whom do you say Jesus is? 5. Is the fire in hell real or just metaphorical? Revelation 9:2 states that there arose a great smoke out of the pit and that “the sun and the air were darkened because of the smoke of the pit.” How could a metaphorical fire produce smoke that darkened the sky? The rich man who had been sent to hell said he wanted a drop of water to cool his tongue because he was “tormented in this flame” (Luke 16:24). If it were only mental anguish or something other than real fire that tormented him, then why would water suffice? If you take the Word of God literally, then it is easy to arrive at an interpretation of literal fire. I understand there are metaphors and idioms; but it’s obvious when they are being applied, such as when Jesus said He was the bread of life (see John 6:48). His Word is representative of bread, and He is the Word. To say that all the verses in question are allegorical would require some proof. Jesus mentioned hell in 46 verses, and 18 spoke of the fires of hell. The word He uses for hell in 11 instances is Gehenna. Gehenna was the Jerusalem city dump, and it burned continually. The unclaimed dead bodies were thrown into that fire, and the wild dogs and maggots ate the flesh. This is a graphic picture Jesus wanted the people hearing Him to see so they would recognize He was giving them a severe, sobering warning. Why would He compare hell with a place were bodies burned if the fire of hell was something quite different? 6. Is it fair for someone to live in sin and at the last moment “get saved”? It doesn’t seem fair. Most of us would think that person deserved hell. The truth is, we all deserve hell. Salvation is not based on our good works. We all are evil in God’s sight (see Ps. 143:2; Rom. 3:10-12,23). Only repentance brings salvation (see Matt. 3:2; 4:17). The point is this: For God to save an extremely wicked person, whether it happens 10 seconds or 10 years before death, shows how loving and forgiving God really is. He is not trying to keep people out of heaven but to get them in. If we can get it in our minds that getting to heaven has nothing to do with our being good, then we can see how He can save a wretch at the last moment. Look at the two thieves on the cross. One said, “If You are the Christ, save Yourself and us” (Luke 23:39). The one thief was humble and knew he deserved his punishment. He also knew Jesus was God. He called on Him at his last moment, and Jesus saved him. That is how loving our God is. You and I might not always be that loving, but God will be. Just imagine, the other thief now has all eternity to think that he was right next to the only one who could have saved him from hell and he didn’t know it—or believe it. What an eternity of the deepest regret. I’m not saying you can live any way you want and then plan to get saved at the last second. God knows your heart, and only true repentance with a sorrowful heart brings salvation (see 2 Cor. 7:9). Also, you don’t know that you will have an opportunity to get saved before you die. Many people die suddenly. Do not take a chance with your soul. Make the right choice today (see Deut. 30:19). Bill Wiese is a former real estate broker in California who in 1998 had a terrifying vision of hell. 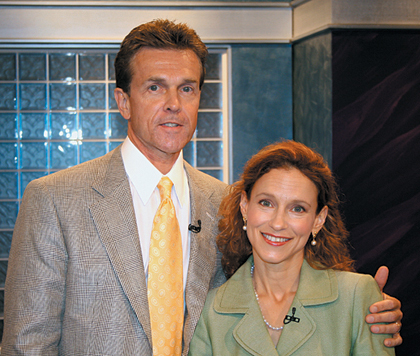 He and his wife, Annette, have since founded the evangelistic ministry Soul Choice. He’s the author of 23 Questions About Hell, which releases this month, and the best-seller 23 Minutes in Hell.